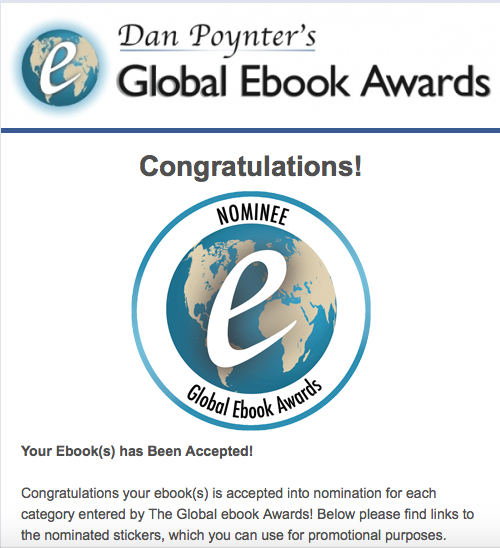 The Dan Poynter Global eBook Awards is one of the few contests that require the author to submit a book that must be evaluated before it is able to be a nominee. I am very happy to say that Mice & Spiders & Webs…Oh My! has now been officially accepted. This entry was posted in Children's Picturebook, Computer speak, Computers for Kids, eBook, Good Listening, sherrill s. Cannon, Uncategorized on September 28, 2015 by Sherrill S. Cannon. Mice and Spiders and Webs…Oh My! 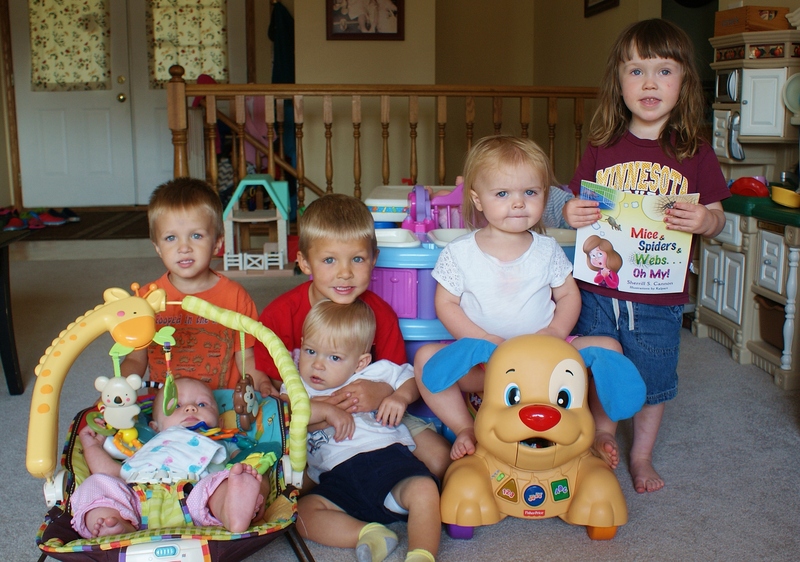 Receives the Day-Care’s Seal of Approval! 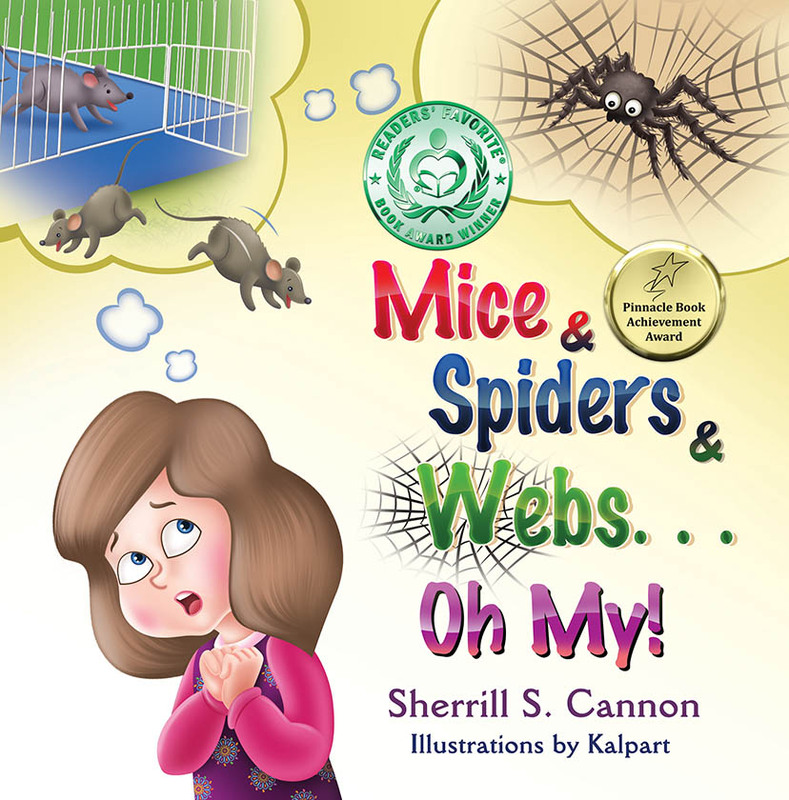 “Mice & Spiders & Webs… Oh My!” is a delightful children’s book written by Author, Sherrill S. Cannon. My day-care children love all of Sherrill’s children’s books and greatly look forward to more and more of them. They cannot get enough of her rhyming, fun and meaningful stories. Each book has an individual lesson to be learned and this one does not disappoint. My daycare children really connected with this lovely story and also were delighted by colorful and fun illustrations created by Kalpart. Thank you Sherrill for yet another amazing and wonderful book!! Thank you to Rita Kaye Vetsch, author of award-winning The Many Colors of Friendship! I have to add another little note that Rita shared with me: “They LOVE LOVE LOVE it and say thanks so much for your kindness. They always look forward to your fun books that have really neat lessons to be learned. .. Keep those books coming, we can’t wait to read more!! PS: Gimme- Jimmy will always be our favorite… the kids clap when I bring that one out!!! This entry was posted in Award-Winning, Children's Picturebook, Computer speak, Computers for Kids, Good Listening, Kid Fans, Review, Reviews, SBPRA, sherrill s. Cannon, Uncategorized on September 22, 2015 by Sherrill S. Cannon. Awesome Review by Dellani Oakes for Mice and Spiders and Webs…Oh My! I am thrilled to share this 5-Star Review from Dellani Oakes, prolific popular author, for Mice & Spiders & Webs…Oh My! Mice & Spiders & Webs….Oh, My! by Sherrill S. Cannon is a charming look at misunderstandings. Rosemary declares she’s no longer going to school because they are going to be getting a mouse. She’s also sure there will be spiders because the teacher mentioned a web. To calm her down, her mother agrees to talk to the teacher the next day. What follows is a humorous look at how children can misinterpret what we say, and the importance os clear communication. As with all Sherrill Cannon’s books, the subject is treated with warmth and compassion. No one makes fun of Rosemary for her misunderstanding and fear. There is a non-judgmental humor to help reveal the message: Talking to our children is so important, as is doing our best to find out the truth, or fallacy, of every situation. Mice & Spiders & Webs…. Oh, My! is very readable for an adult. It would be fun to share with a child over and over again. The bright and colorful illustrations by Kalpart, will engage a child’s attention time and again. This entry was posted in Award-Winning, Children's Picturebook, Computer speak, Computers for Kids, CureJM, eBook, Good Listening, imbullyfree, Review, Reviews, SBPRA, sherrill s. Cannon, Uncategorized on September 21, 2015 by Sherrill S. Cannon. Readers’ Favorite International Award for Mice and Spiders and Webs…Oh My! “The 2015 Readers’ Favorite International Book Award Contest featured thousands of contestants from over a dozen countries. 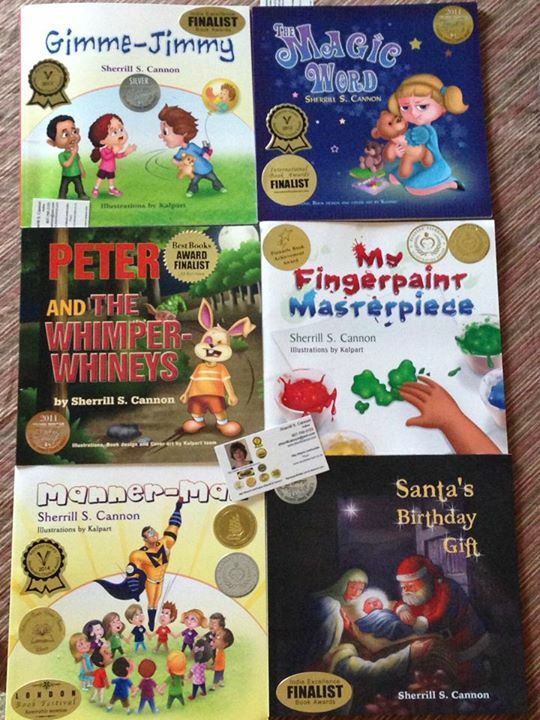 All of Sherrill S. Cannon’s seven children’s books have now won awards in this prestigious contest: In 2011, her first year of entering, The Magic Word won a Gold Medal, Santa’s Birthday Gift won a Silver Medal and Peter and the Whimper-Whineys won a Bronze Medal. In 2012-2013, both Gimme-Jimmy and Manner-Man won Silver medals, and in 2014 her My Fingerpaint Masterpiece won both the Gold Medal and the Illustrations Award. Her 2016 release, The Golden Rule, will be entered next year!! This entry was posted in Award-Winning, Behavior, Children's Picturebook, Computer speak, Computers for Kids, CureJM, eBook, Fundraising, Good Listening, SBPRA, sherrill s. Cannon, Uncategorized and tagged award contest, Book Award Contest, Favorite International Book Award Contest, International Book Award Contest on September 15, 2015 by Sherrill S. Cannon. Gimme-Jimmy will be a part of the 2016 MultiCultural Children’s Book Day Event in January. Thank you, Rita Kaye Vetsch, author of the fabulous award-winning book, The Many Colors of Friendship, for sharing! This entry was posted in Award-Winning, Behavior, Bullying, Children's Picturebook, Consideration for Others, eBook, Fundraising, imbullyfree, Manners, SBPRA, sherrill s. Cannon, Uncategorized on September 8, 2015 by Sherrill S. Cannon. Thank you to Bud Collier for the nice imbullyfree.org endorsement!! If you wish to help, please go to the Imbullyfree Fundraiser Site where 50% of the cost of the books goes to imbullyfree.org… There is a place on the order form to leave a child’s or other loved one’s name to be included in my 2016 release, The Golden Rule. 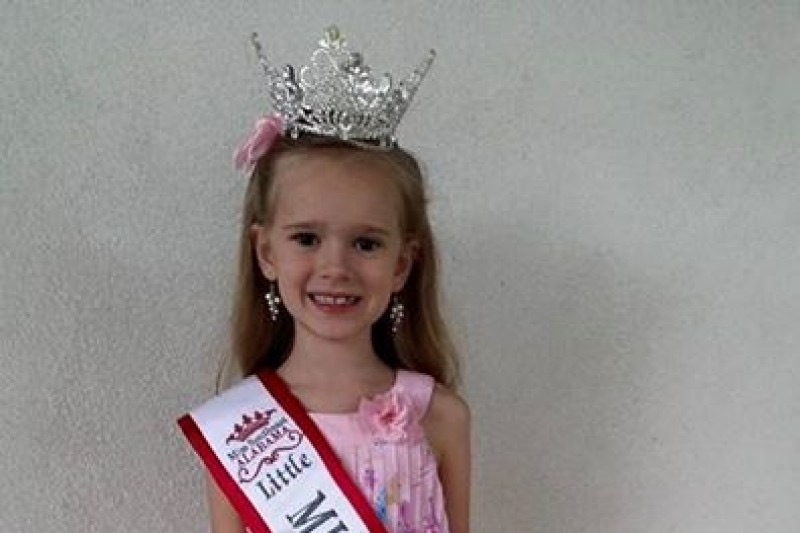 This entry was posted in Award-Winning, Behavior, Children's Picturebook, Consideration for Others, CureJM, eBook, Fundraising, imbullyfree, John 3:16, Manners, SBPRA, sherrill s. Cannon, Uncategorized, Whining on September 4, 2015 by Sherrill S. Cannon. Funds from my Imbullyfree Fundraiser will go to help Alexis continue her efforts to Prevent Bullying! Alexis Wants to Help Prevent Bullying! Alexis was bullied early in life, and has made it her mission to help protect other children and prevent them from being bullied. Thank you to the Imbullyfree.org which has offered to contribute all the proceeds from my Fundraiser for Imbullyfree through October 15th to Alexis to help her on her quest. Please visit the imbullyfree fundraiser site where all of my award-winning books are available, and help prevent bullying!! 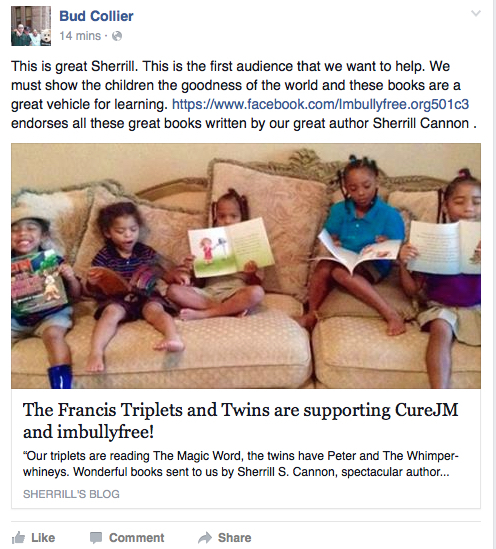 This entry was posted in Award-Winning, Children's Picturebook, Go Fund me, imbullyfree, Kid Fans, SBPRA, sherrill s. Cannon, Uncategorized on September 3, 2015 by Sherrill S. Cannon.